NANO EMULSION FUEL Technology｜NANOFUEL CO., LTD. Reduction effect of fuel saving & harmful exhaust gas is insufficient and in some cases there is a reverse effect in fuel consumption. Since the properties (Water particle size, dispersion state, etc.) of conventional emulsion fuel is non-uniform, the water content and calories varies in each fuel injection in the engine or burning system, consequently output becomes unstable. In most of combustion systems, some of the supplied fuel is being circulated in the fuel system without being consumed. In this case, the separation of the water proceeds at a stretch after the fuel is heated (artificially heated to 60~150 degrees Celsius to regulate viscosity of heavy oil in particular), giving an adverse effect on the combustion system. An additive is necessary in the oils except heavy oils and reclaimed oils, and generally adds 2~3%. For this additive is 2.5~ 8.5 USD/kg, the emulsion fuel is often to be a costly than the original oil. 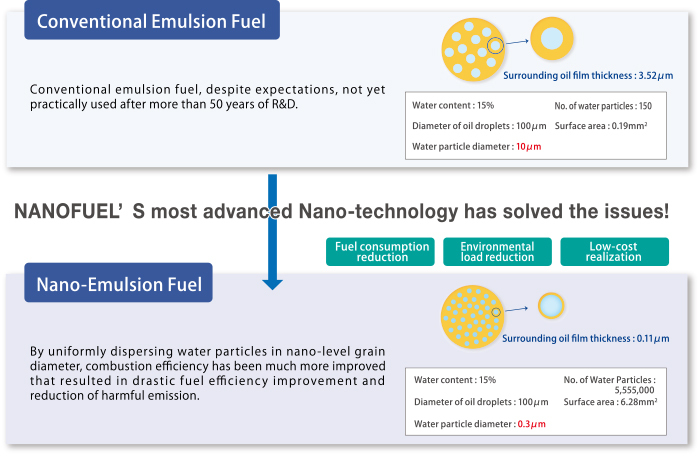 Nano-Emulsion fuel is to uniformly disperse 10~30% of water to the liquid fuel such as fuel oils, and regulate the water particle diameter by 100~500nm (0.1~0.5μm). Also usually it adds a small amount of additive in order to prevent separation of water and oil. Nano-emulsion fuel and conventional emulsion fuel is very similar at first glance, but its performance is completely different. Our Nano-Emulsion fuel performs significant improvement in combustion efficiency, enhanced by the use of original substance atomization technology making the oil film very thin, increase the degree of oil droplets atomization to the limit. As a result, without losing the basic performance as a fuel, we succeeded in completing high quality practical manufacturing product which is extremely effective for fuel saving and low cost fuel production, further the reduction of PM and NOx. 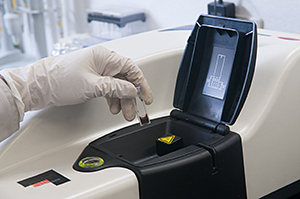 Our Nano-tech is the most advanced atomization technology completed by over 30 years R&D. It has been widely used in various substances and applications such as shredding・cracking of hard materials (e.g. silica and alumina), dispersion such as carbon nanotube, furthermore, emulsification of the oil-water, etc. and adoption track record of the technology in Japan is up to 1,000 companies. The technical biggest characteristic is to have applied very big energy to be called cavitation occurring in a high-speed fluid to nanotechnology. Currently, several similar techniques come out, but it is hardly to follow-up our nano-tech due to a lot of know-how, data, the processing technique of the core part, patents that we`ve acquired. We have developed the optimal fuel and its manufacturing equipment suitable for combustion systems based on original nanotech in order to improve fuel consumption and harmful exhaust gas reduction. This research and development requires advanced sophistication and knowledge of chemistry, physics, mechanical engineering and electrotechnology. We not only well arranged a line-up capable of coping with it but also conducted the R&D with brand-new idea by linking researchers in different fields organically. Research and development of the core parts "Generator"
Various fuel reforming is accomplished in the oil-related companies, but it is research and development primarily from oil properties perspective. On the other hand, engine and boiler manufacturers developed the system design for existing fuel. In other words, a trial to develop new fuel from a diesel engine and a viewpoint on optimality of the fuel is not considered very much conventionally. Our technique achieved fuel saving, reduction of fuel unburned substances and harmful gases by allowing the optimization of fuel in conformity to diesel engines. NEFS Installation is simple and easy, and the cost is relatively inexpensive, which is controlled to adopt the space-saving in-line method that only place it between existing fuel tank and combustion facilities. In accordance with the fuel use, etc. of combustion facilities to control its production volume. Re-emulsify the leftover Nano-Emulsion fuel in the tank/pipes when re-run long-term no use system. Switch it to the original fuel line by any chance when malfunction occurs in NEFS. Easily pull out the air which is generated during the filter cleaning on the site. System to monitor constantly the fuel manufacturing situation at headquarters. Although the normal emulsion fuel has been used 3% to 5% of the additives, Nano-emulsion fuel only adding around one-tenth, a very small amount of additive of other companies could be able to maintain stability without occurring any irregularity. Additive "NANOEMER" is Nano-Emulsion fuel dedicated additive co-developed by Miyoshi Oil & Fat Co., Ltd. and NANOFUEL. All correspondence is not possible with the existing additive since the property is largely different at the same oil species, further it shall respond to a variety of oil species such as kerosene, light oil, fuel oil A, MDO, MGO etc. Our dedicated additive has enabled Nano-Emulsification of all these fuels by changing the combination of two kinds of additives. To introduce new fuel to an existing fuel market, their effectiveness must be well established that there is no adverse effect on the diesel engines. In other words, the evaluation examination by manufactures, public institutions and test data become important. We`ve carried out evaluation tests with a number of customers including industrial furnaces such as asphalt kilns and aluminum melting furnaces, boilers, land-use generator engines, marine main engines, accordingly demonstrated fuel saving, harmful emission reduction effect. Particularly with regard to the application of the diesel engine system, we`ve received high assessment in the joint tests with the engine makers on the simultaneous achievement of fuel saving and NOx reduction by incorporating NEFS, which has been an unsolved trade-off until now. In diesel engine, sprayed (liquid) fuel in combustion chamber rapidly rises in temperature and oil droplets, burning from surface toward center core, generate energy such as heat and pressure. In the process of temperature rising, water enveloped by oil comes to evaporate earlier than oil and to expand in volume　(1,700 times larger under atmospheric pressure), and to decompose and atomize circumjacent oil drops. By this, surface area of oil drops enlarges and burning efficiency is to be improved. The thickness of oil film of Nano Emulsion Fuel is thirty-third part of that of conventional emulsion fuel, which make the oil drops much fine and dramatically enlarge the surface area thus the effect can be much bigger. 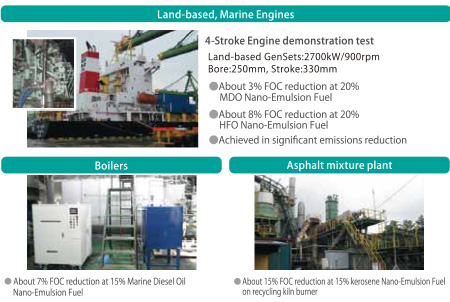 Evaluation tests for Nano Emulsion Fuel have been conducted not only by 5 domestic & 1 oversea major engine manufacturer but at major companies among various industries such as shipbuilding, road construction, foods, chemical, aluminum and so forth, all of which have proved improvement of fuel efficiency and drastic reduction of harmful emission.